In the 18th and early 19th century, there would have been no foundation plantings. The present plantings and trees in front of the house, as well as the small hillock, represent the landscape created by Commodore Robert Field Stockton in the mid-19th century. Between 1766 and 1771, the road that had run right in front of the porch was straightened to run along its present alignment (Route 206/Stockton Street). Richard “The Signer” Stockton, then bought the land between Morven and Stockton Street. This foreground created a more formal setting for the building. To mark his purchase, he planted a row of thirteen catalpa trees along the new boundary, representingeach of the newly declared states. The catalpa trees were replanted in 1999, and the fence is a reproduction of Morven’s mid-19th century fence. His son, Richard “The Duke” Stockton, laid out the present horseshoe-shaped drive; at the same time he built a paved forecourt in front of the house. In his day a symmetrical landscape plan would have been favored, in contrast to the picturesque, irregular design applied to the front plantings we have today. The landscaping, regardless of head of household, was always intended to impress visitors as they passed on the road or approached the house. By the time the Commodore began to improve Morven in the 1850s, a picturesque, curvilinear landscape style was in fashion. There was an attempt to make plantings appear “natural” with a varied terrain rather than a flat surface. The Commodore’s landscaping therefore featured a front lawn with irregularly placed trees and a small hillock in front of the house. The flowers and shrubs planted now are drawn from 19th century descriptions and photographs. 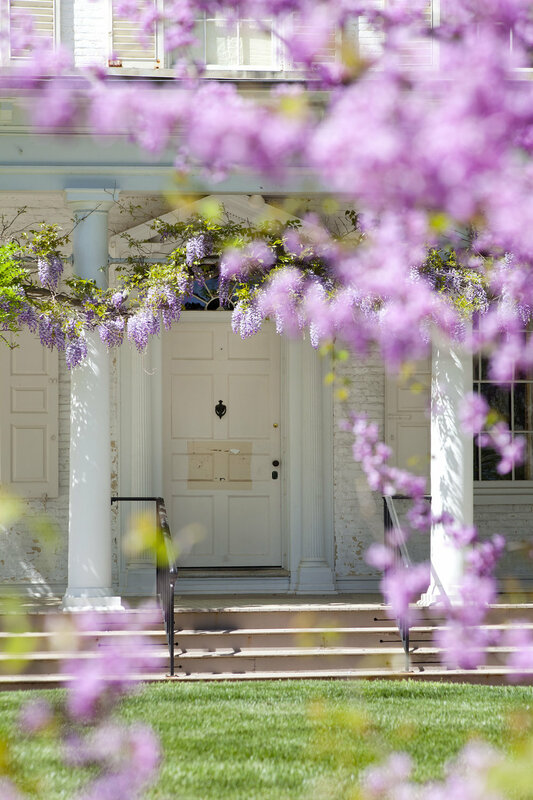 The wisteria draped across the front portico first appears in photographs taken in the 1880s. Helen Hamilton Shields married Richard the Signer’s great-great-grandson Bayard Stockton in 1894. Intensely proud of the Stockton family’s history, she wished to “restore” the house and gardens to what she perceived as their former glory. Although the property was reduced in size to our current five acres, she was determined to reproduce what she thought Annis and Richard’s garden had been. In a manner typical of the Colonial Revival, she included not only plants thought to have grown at Morven, but also specimens from various historic sites. She spoke and wrote extensively to promote Morven’s significance; her garden at Morven was included in the Garden Club of America’s 1930s landmark publication, Gardens of Colony and State. After Bayard Stockton died in 1928, Robert Wood Johnson, head of Johnson & Johnson, rented Morven. He used it as a comfortable suburban retreat, keeping horses in the stable and adding recreational facilities. 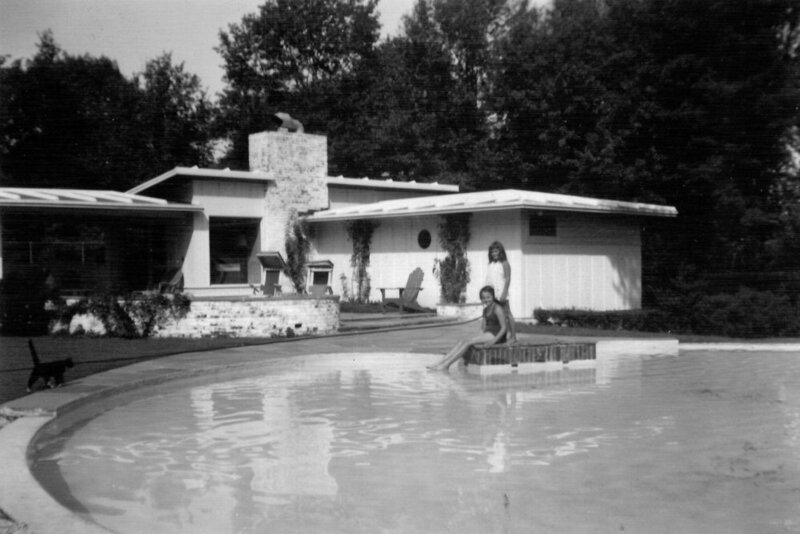 In 1939, he had plans drawn up for leveling the grounds and constructing a pool, pool house, and tennis court. The last governor to occupy Morven, Brendan Byrne, was a tennis enthusiast. During his tenure, tennis star Althea Gibson became the honorary resident pro at Morven, and she and Byrne played many friendly games on the Morven court. The pool house was restored in 2011 and the the apple shaped pool was turned into a splash pad. This excerpt of a pastoral written by Annis Stockton in 1781 references the apple orchard at Morven. Apple trees were grown in great numbers in the eighteenth century for food, drink, and animal feed. Annis’ poems also reference peaches, plums, pears, and cherries harvested and dried by her at Morven. Annis’ son, Richard, the Duke employed landscaper, Stephen Denfer of Essex County to make improvements to the Morven grounds. Denfer had worked as a landscaper for the Duke’s uncle and aunt Elisha and Rachel Bradford Boudinot. The Duke wrote to his uncle asking him to send cuttings from superior apple and pear trees that Denfer could graft onto Morven stock. They must have been successful as the Duke was proud of his cider, “as fine as wine” and enjoyed sending barrels of it to his friends. Locations of the orchards are described in the Duke’s will which references an old orchard “near the quarry to the garden fence” and newer orchard west of the house. The orchards likely stretched from present-day Boudinot Street to Westcott Road. We have planted crabapple trees along the Boudinot fence line in homage to the acres of orchards that had grown beyond it in years past. Morven’s demonstration garden is endowed by Colleen Goggins. The garden is also supported by a grant from the Garden Club of America. Research done in the 2000s revealed that Commodore Robert F. Stockton (1795-1866) had built the greenhouse during his tenure. Account books showed that the Commodore had paid for the installation of gutters on the building in October 1854, placing its construction at roughly 1852-54. An inventory upon his death indicated that the greenhouse contained 15 lemon trees, 100 Japonicas, 10 cacti, 4 azaleas, 3 Daphnes and “Misc. plants.” Based on research it is believed the greenhouse was torn down in the 1880s. Archaeological excavations carried out between 1987 and 1990 revealed traces of at least two terraced gardens directly behind Morven. These were connected by fieldstone and gravel walks extending northward from the house and defining rectangular plots. A French map from the period also depicts Morven with terraces and garden plots arranged in formal, symmetrical fashion. Bird’s Eye View of Princeton, N.J., 1874, drawn by H.H. Bailey, lithographed by Breuker and Kessler of Philadelphia, and published by Charles O. Hudnut of Philadelphia. Courtesy of the Graphic Arts Collection, Department of Rare Books and Special Collections, Princeton University Library. Determining the age of Morven’s garden wall is difficult to pin down and not well documented. Archaeological evidence suggests that it was erected during the 1850s to separate service function—the kitchen garden, woodhouse, stable, laundry—from ornamental landscaping. It was like lengthened and repaired as necessary through the nineteenth century. Around 1916 Helen Hamilton Stockton (1864–1949) added the section of brick wall that runs between the wash house and the main house, replacing a latticework fence. She used bricks salvaged from the University Hotel which stood on the corner of Nassau Street and University Place and was demolished that year. Guided Garden Tours are available in-season by reservation at $10 per person. To inquire about a tour, please call 609.924.8144 x 106. Morven’s annual Heirloom Plant Sale, held during Morven in Mayweekend, features “Morven Classic” flowers, including roses, peonies, and scented annual flowers and vines. Loyal plant sale patrons know to come to Morven in May to find fragrant and hardy heirlooms uncommon in modern nurseries. Visit Morven in May’spage for further information on this weekend long event!